While opposed to all religion, the British evolutionary biologist and author of The God Delusion has been rethinking his positions and insisting that certain distinctions must be made between one religion and another. “If you look at the actual impact that different religions have on the world it’s quite apparent that at present the most evil religion in the world has to be Islam,” he said. In the face of growing Islamic terror, Dawkins has begrudgingly admitted that Christianity may actually be society’s best defense against aberrant forms of religion that threaten the world. Despite his animosity toward Christianity, Dawkins has acknowledged that the teachings of Jesus Christ do not lead to a world of terror, whereas followers of radical Islam perpetrate the very atrocities that he laments. 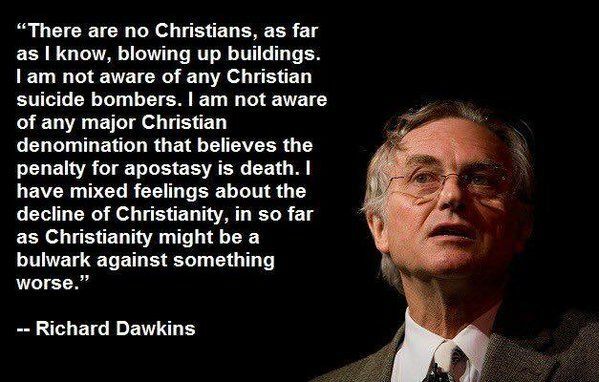 Faced with this realization, Dawkins has wondered aloud whether Christianity might indeed offer an antidote to protect Western civilization against jihad. “I have mixed feelings about the decline of Christianity, in so far as Christianity might be a bulwark against something worse,” he said. In his address last Sunday, Dawkins was swift to assure his hearers that his assessment of Islam was not a condemnation of all Muslims. “It’s terribly important to modify that because of course that doesn’t mean all Muslims are evil, very far from it. Individual Muslims suffer more from Islam than anyone else,” he said. “They suffer from the homophobia, the misogyny, the joylessness which is preached by extreme Islam, ISIS and the Iranian regime,” he said. At the same time, Dawkins was careful to distance himself from U.S. President Donald Trump in his search for a remedy to the situation. “So it is a major evil in the world, we do have to combat it, but we don’t do what Trump did and say all Muslims should be shut out of the country,” he said. “That’s draconian, that’s illiberal, inhumane and wicked. I am against Islam not least because of the unpleasant effects it has on the lives of Muslims,” he added. Going back on earlier statements in which he has said that the religious education of children is a form of “child abuse,” Dawkins confessed he believed British schoolchildren should have a religious education, and be familiar with the Christian Bible. “I think that it is an important part of our culture to know about the Bible. After all, so much of English literature has allusions to the Bible, if you look up the Oxford English Dictionary you find something like the same number of quotations from the Bible as from Shakespeare,” he said. ‘It’s an important part of our history. So much of European history is dominated by disputes against rival religions and you can’t understand history unless you know about the history of the Christian religion and the Crusades and so on,” he said. In The God Delusion, Dawkins argued that bringing a child up Catholic is a form of child abuse and causes more “long-term psychological damage” than sexual abuse.